More than 4 out of 10 people moving to New Mexico cited retirement as a reason, according to data from United Van Lines. Retirement was also a top reason why people relocated to Florida and Arizona — and why they are fleeing New Jersey. Those were the findings from a survey by United Van Lines. The relocation company polled 26,998 of its customers who moved last year, through Nov. 30, 2018. Among those who moved to New Mexico, 42% said they did so because of retirement, making the Land of Enchantment a top destination. Florida came in second, with 38% of people moving there citing "retirement" as a reason. Arizona followed in third, according to United Van Lines. Meanwhile, those golden years were also a primary reason why people fled New Jersey, with a third of households citing that as a driver behind their decision to leave the Garden State. Maine and Connecticut round out the top three states people are moving away from citing retirement, the moving service found. There are a number of reasons why people approaching retirement might want to relocate. Chief among them is the need to stretch their savings and their Social Security checks. "The cost of living is a key factor, said Dan Herron, a CPA and partner at Better Business Financial Services in San Luis Obispo, California. "We look at their budget and see how much they spend and how long it will last," he said. That means examining the cost of housing, medical expenditures and more. Clients nearing the end of their working careers have asked Herron about leaving the Golden State for Arizona, Colorado or Oregon. Reasons for leaving California include favorable income tax rates in other areas, Herron said. California has a top individual income tax rate of 13.3%. The top marginal rates are lower in Oregon: 9.9%. They're nearly half that amount in Colorado (4.63%) and Arizona (4.54%), according to the Tax Foundation. Another consideration is how does your destination state treat retirement income? In all, 13 states tax Social Security: Colorado, Connecticut, Kansas, Minnesota, Missouri, Montana, Nebraska, New Mexico, North Dakota, Rhode Island, Utah and Vermont. Don't forget to think about how other levies might affect your expenses. Indeed, New Jersey — which is experiencing an outbound flight of residents — has an effective property tax rate of 2.13 percent, according to the Tax Foundation. It's the highest in the country. 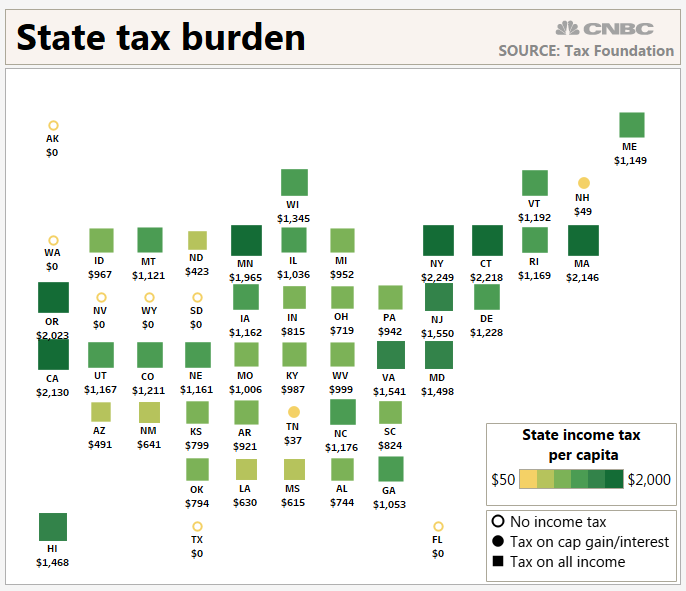 The Garden State also has a top individual income tax rate of 10.75 percent, applicable to income exceeding $5 million. "A lot of places that don't tax income have high property taxes, so we need to make sure it makes sense to move there," Herron said. Though affordability is an important factor when deciding where to reside in retirement, there are other considerations. Here's some things to weigh before you go. Should you keep family and friends nearby? "Maybe you can afford to move, but do you really want to do it?" asked Herron. "There's an emotional impact of moving away from your family and friends, and starting over." Ask yourself whether you'll be able to reach a relative in the event of an emergency. Take an extended visit before you choose. Whether you're leaving St. Louis for Honolulu or the U.S. for Costa Rica, you should get to know what your destination is like — preferably outside of high tourist season — before you settle down. Call your financial advisor. Aside from making sure your move is financially sensible, you should also go over your estate plans. "If they're moving to the wilderness, we need to know do they have their trusts and estates in order, as well as their beneficiaries," Herron said. "Do they have an advance directive in place?"